Give these to her and give her space. They really bring out her inner beast. it's all that remains from the pig?? my secret word to day to get in was unite ckn. I think I will go get some chicken for dinner. My pups looooove the Greenies! I just found something much safer a few weeks ago that the pups get just as vicious for called Bonies which break down and digest because they use brown rice instead of gluten and cellulose. My dog too. It's like doggie crack! That's too funny! Looking at all of Nunu's chewables, I was thinking - "I wonder if they know about Nylabone!" When my poodle (now 14 years old) was a puppy, she was SUCH a chew hound. But when we bought a bunch of nylabones (she liked the rubbery ones best) she would chew for hour after happy hour. Nunu clearly thinks she is a very big, fierce dog. Apparently a cross between a Rottweiler and a wolf in her mind! I have a great recipe for healthy dog bones/treats..I make them all the time at christmas for all my friends with doggies..they love me..the friends and the dogs.if you want the recipe let me know..i have little bone cookie cutters and so they are bone shapped too. Same exact thing happens with my chihuahuas! They will be all cuddly and lovey and then give them a greenie and they will growl and snap at you like you are a stranger trying to steal their baby. I love how crazed she looks in all of these chewing pictures. This chewing is SERIOUS BUSINESS! Its like how my cats look when they smell chicken in the air. You should see me when I catch the scent of chicken in the air. Give her one of the jumbo Greenies and see how long it takes her to get through it. Or if she can even carry it in her mouth. You should see if Nunu likes Ben & Jerry's Willie Nelson Peach Cobbler ice cream. I've been known to elbow some people who get to close to mine. Same thing happens to Kira when she gets a greenie. I haven't noticed much of a breath improvement though, have you? Those greenies are bad news for your nose...they give my dog really bad gas. You ain't lying about stand back lol. that's just like my dog when she steals a corn cob out of the compost! she goes all rambo! greenies not so much. They just make my dog mean. She is very controlling of her toys and chewie things. You should try those skinny rawhide sticks sometime. When I gave them to my dogs, it was like crack or something. There was some INTENSE, FOCUSED CHEWAGE going on there and I was in no way allowed to take them away from the dogs. 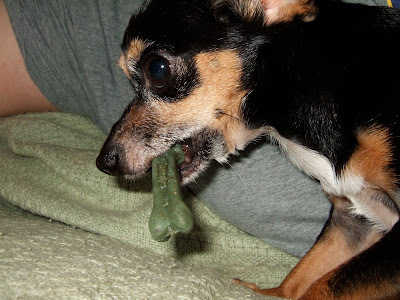 Anyway, now he will sit with a greenie held between his paws and lick it like a lollipop until it falls apart.